Bill Addison has eaten burritos in almost every corner of the country. While at the San Francisco Chronicle, he once ate 100 burritos (and 300 tacos) in 10 weeks to find the best taqueria in the Bay Area. He also worked at the Dallas Morning News and now writes for Eater. When we appointed a Burrito Selection Committee to chose the 64 burritos that would compete to become America’s best, we called on the expertise Addison gained as a writer for Atlanta Magazine and a board member of the Southern Foodways Alliance. I talked to our scout for the South about Yelp, the world food movement and the Hot Tamale Trail. Anna Maria Barry-Jester: When we first spoke, and you weren’t the only one, you mentioned the mistrust that food critics have for Yelp. Do you use Yelp at all, and if so, in what capacity? Bill Addison: Let me be clear on my stance on Yelp. 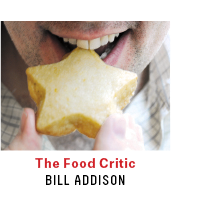 I think that citizen criticism absolutely has a place in popular food culture. But to answer your specific question, I will use a site like Yelp to seek out restaurants that are obscure. If I’m trying to locate some Russian cuisine in Atlanta, I might go on Yelp and see if there are any listings. I think that Yelp is useful as a restaurant phone book of sorts, with commentary. AMBJ: So, it’s fairly exhaustive in listing most of the restaurants in the U.S.? BA: Right. Now, when it comes to recommendations, that’s when I feel that paid critics who are beholden to ethical standards by their publications to approach a subject fairly and with context, and with critical knowledge as a base for their job, are more trustworthy. In other words, they’ve been doing this for a while and they’ve eaten a few burritos or at a few sushi joints, and so you trust that they have a level of context. That is where I feel that Yelp really lacks. Of course, there are some good Yelpers who bring some expertise, and you can seek out their voices of trustworthiness. But in general, I will always look to a professional critic’s opinion before I trust a Yelper’s opinion. AMBJ: What did you think of the experience of using Yelp data to filter through the burrito options in the U.S.? BA: What I found most useful about the Yelp data in this search is it led us to some places that we might otherwise overlook. Key West is one that pops to mind. It also brought up an interesting discussion about the wrap joints that were popular in the late ’90s, early 2000s, where it was a burrito format: a tortilla wrapped around ingredients that encompassed a wide range of global flavors. I feel like that culture may have stuck in the South more than any other place, which is not to say that the majority of those places did not close, but through that cross-section of the South [from Yelp] we saw that the burrito has become more of a convenient, handheld, fast-service food item that doesn’t necessarily reflect its Mexican roots beyond using a tortilla and perhaps rice as the main ingredient. AMBJ: Yeah, there was this movement of world food and world music that was partly about bringing these flavors and cultures that weren’t indigenous to the United States and combining them in new ways. BA: Right. A lot of the burrito-selling establishments in the South, you find those flavors that spread to curries, to Mediterranean flavors, as well as the more traditional Mexican ingredients. I liked the metadata that Yelp generated. Again, let me be clear that I found that beneficial because it was a meta-document from Yelp, and I don’t think it would have been that obvious if I’d just done searches for burritos in Louisville, Kentucky, and Miami, Florida. But because we were looking at the breadth of Yelp data, it was easy to pick out. Given that there are limited options in the South, what was high on the Yelp list did in some ways mirror what we felt good about putting on the bracket in the South. AMBJ: One thing that we all found with Yelp is that the scoring seems to be highly skewed toward service and the cost/value of the food, and those things are obviously real concerns for consumers. How do you take that into account when you’re doing food critiques? BA: Part of food criticism is looking at a restaurant on its own ambitions and judging them accordingly. So, if I am going to Taquería La Oaxaqueña in Atlanta and the tlayuda delivers this whole universe of flavor on a tortilla, I find that exceptional. If I’m going to a very high-end Mexican restaurant and the foie-gras-stuffed chile relleno is small and fiddly, and the textures are weird, and it costs $22.95, I’m going to take that into consideration as well. AMBJ: So, what’s your take on burritos in the South? BA: It’s a challenge to find a great burrito in the South (laughs). And I am grateful for the great burrito joints that are here, because my time in California really gave me a taste for burritos. But I feel like when people have a sample of the burritos in the West and they come back South … the West offers an epiphany in burritos that you can’t find in the South. AMBJ: Beautifully put. You have lived and worked in two of the epicenters of Mexican-American cuisine, Dallas and San Francisco. What do you miss about those places? BA: What I miss about those places is two-fold. I miss the Mexican food that’s so close to its origins. I’m not a fan of the word authentic. I think it’s a loaded word. I feel like any time any food leaves its place of origin, its authenticity is called into question. So I’m avoiding that word. I miss Mexican food that strongly reflects the regions from which it came, and I also miss the way that Mexican food has been amalgamated into the regional American cultures of those areas. I miss Mission-style burritos; the care that goes into the construction of those burritos beats just about anything I can find in the South. In Texas, I really grew to love Tex-Mex food, and as much as I love what Texans will call Mex-Mex, the traditional moles, the seafood dishes of the coastal states, I also miss a really righteous plate of cheese enchiladas. AMBJ: What role does Mexican food play in Southern cuisine? BA: It plays a scattered role. By that, I mean that there is no one overarching role that Mexican food plays in the Southern diet. First of all, the burrito culture is obviously not as well established as it is in California and the West. Perhaps we can attribute that to the fact that Mexican immigrants tend to come from Southern states like Veracruz, rather than Northern states where the burrito culture potentially originated. This is definitely more the land of tacos and tamales. When talking about the most influential aspect of Mexican food and Southern culture, it’s probably the tamale, and the way the tamale has become a culinary institution in the Mississippi Delta. AMBJ: Is that purely a product of immigration patterns, or is there a reason that tamales seem to resonate in the Delta? BA: There are two theories about that. I’m getting my information straight from the Hot Tamale Trail of the Southern Foodways Alliance, and I encourage everyone to read it. The prevailing thought is that Mexican immigrants were brought in as migrant laborers in the 20th century, and because they were likely working right alongside African-American sharecroppers, their culinary traditions mingled. The care and feeding of the Mississippi Delta tamale tradition largely resides in the hands of African-Americans these days. AMBJ: We’ve spoken about your first major assignment at the San Francisco Chronicle, when you ate 100 burritos and 300 tacos in 10 weeks. You not only lived to tell about it, but you lived to still love burritos. I wondered if you have any advice for me before I go on this trip to taste our 64 top burritos, so that I can love burritos at the end just as much as I do now. BA: You’re going to have to learn to love the differences. It’s going to become apparent to you really quickly that not every burrito is made equally. And you’re going to know when to stop eating. You’re going to find that when you come across a burrito that’s transcendent, that you’re going to eat more of it than you expected to eat. And when you come across a bad burrito, you’ll eat exactly enough bites to understand the depth of its deficiencies and you will move on.